Dilys Jackson was born in Sri Lanka and some of her childhood was spent in South Africa but her parents were from Abergavenny and it was to Wales that she returned after attending the Slade School of Fine Art, London. During her teaching years in Special Schools in South Wales she also gained a BA in Psychology from the Open University and an MA in Fine Art from UWIC. Slade School and Swansea College of Art, Dilys taught and qualified at BA Psychology (Open University) and MA Fine Art at Cardiff. She has produced numerous public works including the Ogmore Valley Route benches, the Betws Village centre paving and railings, the Sight Garden in Stackpole and the Copper Mill Millennium Sculpture in the Greenfield Valley, Flint. She has traveled and worked in Europe, Australia, Iceland, the Americas and the Middle East. She was awarded a Leighton Fellowship Residency at BanFF Centre for Arts, Canada in 1995. She was also the Artist in Residence with Groundwork Trust in Bridgend for a number of years. Other awards include an Arts Council of Wales Masterclass at MB Fine Art Foundry , Clynderwen. Dilys Jackson is an associate of the Royal British Society of Sculptors, a member of Sculpture Cymru, and the Welsh Group. The body, plants and land, working in series relating to conflict, construction, destruction and agreements. 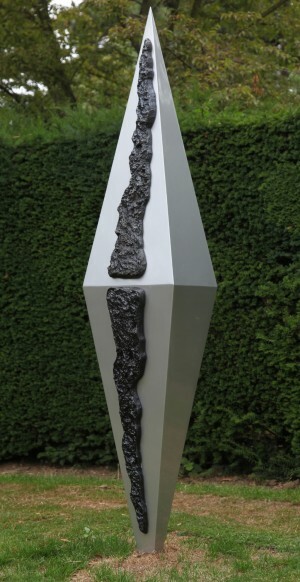 She is held in numerous public and private collections throughout the UK, Europe and America, and has exhibited her work in the UK, France, Spain, Russia and America.